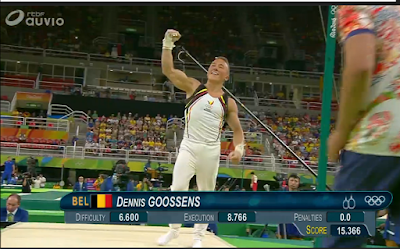 Belgian Gymnastics: 2016 Olympic Games: historical rings final for Dennis Goossens! 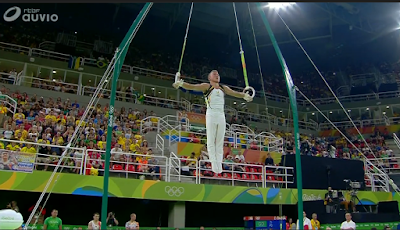 2016 Olympic Games: historical rings final for Dennis Goossens! Here we go! 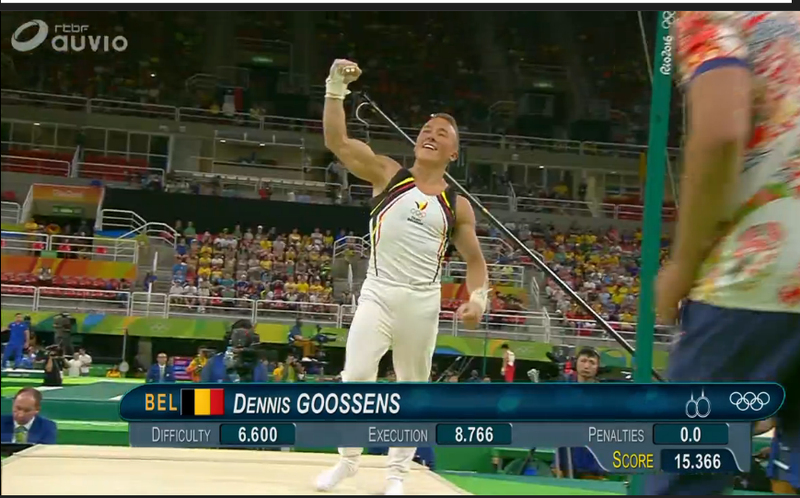 The Olympic Games officially started on Friday, but no time to celebrate for our gymnast, as Dennis Goossens was in the first subdivision on Saturday morning. Only one goal : to qualify for the final. The young gymnast from TK Kerels Waasmunster gym club only competed on rings, his best event, and the most difficult part for him was to wait. He had to wait for the first four rotations to be over before mounting the rings, and then he had to wait for two complete subdivisions to end. Only then would he know if he had made it to the final. It's not the kind of things made to reassure you. But Dennis was at the top of his game yesterday. The objective was to score close to his main rivals, World and European Champion Eleftherios Petrounias (Greece) and Olympic Champion Arthur Zanetti (Brazil), both in the same subdivision as Dennis. And he did so amazingly well, scoring 15.366 and placing in a provisionary 3rd place, ahead of one of his main rivals, Yuri van Gelder, from The Netherlands. In the next subdivision, his biggest threat was Samir Ait Said. The French man actually outscored Dennis (15.533). Rings are also Ait Said's best event and he has said many times before they were his main goal. But in the next rotation, the vault, Samir suffered the worst injury I've ever seen : a double tibia-fibula fracture after a bad landing on the vault. This injury virtually put Dennis in 3rd after two subdivisions, but I personnally choose not to rank him in that position, as I thought Samir fought for that spot, and I didn't want to take it away from him so early. It is obvious though that he won't be able to enter the final. The last subdivision was probably the most stressful, as Igor Radivilov and Oleg Verniaiev (Ukraine), Yang Liu and Hao You (China), and Russia's Denis Ablyazin were strong contenders. In the end, only three of them managed to place ahead of Dennis, sending him to the rings final. This qualification is history making once again, a fate Belgian gymnastics seems to have accomplished quite a few times in the past few years. 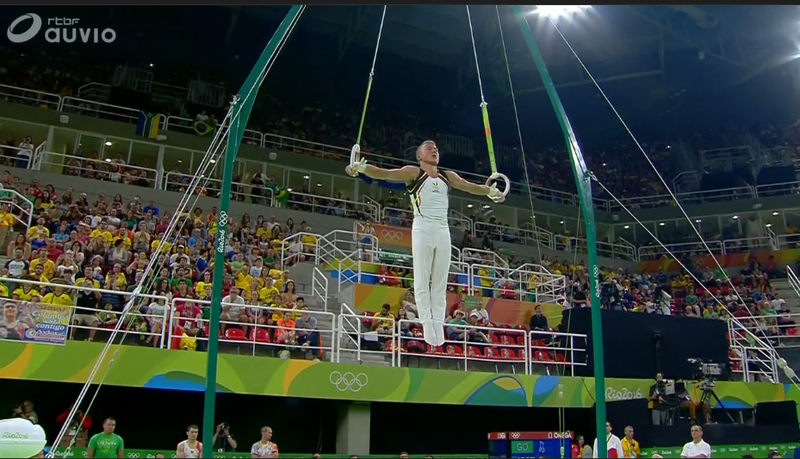 Never before had a Belgian gymnast qualified for an event final at the Olympic Games! The job is done for Dennis. the final won't take place before next Monday. He can now relax and enjoy the page of history he just wrote for his country. Proficiat Dennis!